Ada pertanyaan untuk Novotel Phuket Kata Avista Resort and Spa? 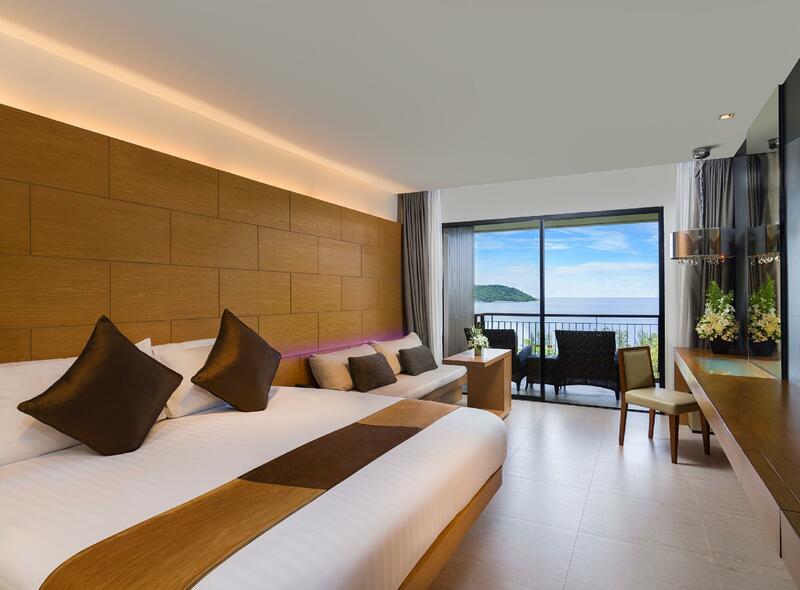 Terletak strategis di Kata, Novotel Phuket Kata Avista Resort and Spa adalah tempat ideal untuk memulai menjelajahi Phuket. Hanya 20 km dari pusat kota, lokasi hotel yang strategis ini memastikan para tamu agar dapat secara cepat dan mudah mencapai ke tempat-tempat menarik. Dengan adanya obyek wisata utama kota ini seperti Dino Park Mini Golf, Stadion Peringatan Ibu Suri, Pantai Kata yang sangat dekat, pengunjung akan sangat menyukai lokasi hotel ini. Novotel Phuket Kata Avista Resort and Spa menawarkan pelayanan sempurna dan segala fasilitas penting untuk memanjakan para wisatawan. Para tamu hotel ini dapat menikmati fasilitas di tempat seperti layanan kamar 24 jam, WiFi gratis di semua kamar, satpam 24 jam, layanan kebersihan harian, layanan taksi. Semua akomodasi tamu dilengkapi dengan fasilitas yang telah dirancang dengan baik demi menjaga kenyamanan. Hotel ini menawarkan fasilitas fantastis, termasuk hot tub, pusat kebugaran, sauna, kolam renang luar ruangan, spa, untuk membantu Anda bersantai setelah sepanjang hari beraktivitas di kota. Fasilitas super dan lokasi yang istimewa menjadikan Novotel Phuket Kata Avista Resort and Spa tempat yang sempurna untuk menikmati penginapan Anda selama di Phuket. Tamu berusia 16 tahun ke atas dianggap sebagai tamu dewasa. Perlu diketahui bahwa akan ada biaya tambahan sarapan untuk anak berusia di bawah 12 tahun, dan dibayarkan langsung di hotel. Menuju hotel ini harus melalui tanjakan yang cukup terjal (mobil harus gigi 1), ada rental motor deket hotel ini (250 Baht), deket juga dengan resto lokal, deket juga dengan pantai, dan hotel ini selain menyediakan airport transfer juga menyediakan shuttle menuju Patong (gratis). Saya menginap di Avista hotel selama tiga hari dua malam untuk honeymoon. menurut saya itu adalah pengalaman yang sangat menyenangkan. Kamar yang sangat amat luas dan bersih dengan pemandangan kolam. Tempat tidur yang sangat nyaman hingga membuat saya dan suami malas untuk beranjak. Kekurangan hotel ini adalah lokasi yang sangat tinggi, sehingga memerlukan effort yang cukup besar untuk mendaki ke hotel. untuk meminjam motor disini juga cukup mahal, yaitu 300 Baht. Sangat disayangkan pula tidak ada fasilitas compliment travel untuk mengantar hingga ke airport, sehingga saya harus membayar Baht untuk bisa sampai di airport dengan menggunakan taxi service. Tetapi secara keseluruhan sangat menyenangkan di Avista Hotel. Thanks Avista. Good location with lovely views (it is up a steep hill, so need to consider that). Super staff. Breakfast just OK, but the best omelette I have had in a long time. The only negative was the towels in the bathroom, they were abnormally large, bordering on unusable and the environmental impact of cleaning them breaks my heart. All in all, a great property. Dear Paul , Thank you very much for your reviews on Agoda regarding your stay with us at Novotel Phuket Avista Kata Resort and Spa. Your comments will pass to all department concerns to encourage and continue to provide the best service to our guests. Thank you once again for sharing your comments and we look forward to welcoming you once again in the near future, should the opportunity allow. Warm Regards, Novotel Phuket Avista Kata Resort and Spa. This hotel is listed as a 5 star hotel and after staying here for 3 nights I can tell you it is not anywhere near even a 4 star hotel. The breakfast was the worst quality I have had, selection was poor and very budget like. Big thing to know is to get to the beach you have to go down a seriously steep hill- coming back up was hard work and very sweaty. Dear Yang , On behalf of Management and staffs of Novotel Phuket Avista Kata Resort and Spa, we would like to thank you for taking the time to reviews following your recent stay on Agoda. Your kind remarks regarding room assigned , amenity set up are received with great pleasure and have been conveyed to all Department Heads concerned. These will certainly serve as encouragement for us to continue improving the standard of our services. Looking forward to welcome you back for your next trip in Phuket. Warm Regards, Novotel Phuket Avista Kata Resort and Spa. You will need to book your seat on the "shuttle bus" to the beach otherwise they don't let you on it. There is a very steep climb up the hill to the hotel, impossible to make with baggage. Don't be fooled by the wide angle lens pictures of the pool. Very little options for vegetarians on the menu. A nice lady will talk to you all agreeably about your air-conditioning and lights flickering in your room but clearly do not carry out regular checks on the room to ensure that they are fit to be stayed in. I would fully recommend the Lata Palms Resort Spa around the corner. Much better vulue and quality of facilities. The hotel is located on a little hill between Kata beach and Karon beach and is about a 10 min walk to each of them. The hotel offers a shuttle to Kata beach several times a day (not to Karon beach however) and to Patong Beach. We got a room upgrade when we arrived and stayed on top floor (5th floor) of their second building with a view of the sea. The room was big and in good condition. They provide pool/beach towels in the room as well. We really enjoyed the pool and pool bar. Breakfast was good. Their spa is very nice as well. It is quite small and busy so you need to make a reservation before hand. Dear Alexandra , We are delighted that our service has met your satisfaction and we were very pleased to serve you our service. Moreover, We are very thankful for your comment on Agoda and looking forward to welcome you back for your next trip in Phuket. Warm Regards, Novotel Phuket Avista Kata Resort and Spa. The Novotel is a very good 4-star property in a good location - ten minutes' walk to the beach or the town. My room (118) looked out over the pool but the sea was not visible. I think there are seaview rooms on the top floor of my building, and there are also "garden view" rooms at the back of the building that look onto a brick wall ... My room like all rooms had a spacious balcony with comfortable armchairs, a good bathroom and a good work desk. There is a lovely swimming pool (although some tiles are missing) and excellent warm and welcoming staff. The hotel is located on a hill and has quite a few stairs, and it is quite a walk up the steep slope to get the the shops and eateries nearby. It is manageable if you are OK to walk a bit. I like the resort feel of the hotel, located in a quiet area, lots of trees, nice pool with lots of sun chairs. Staff were very friendly, rooms were nice and clean. The room is spacious and the location is accessible to restaurants and shops. The only disadvantage is the walking up the steep slope which can be quite tedious. Best is to rent a car or bike in Phuket. Love the beach! Room is spacious. Friendly staff. Resort is up on top of a hill. This make resort a quiet out if the noise from roadside traffic and night life on the street. Only downside is need strong leg to go down and up the hill. Had a great and lovely anniversary celebration there! Good arrangement of staff, nice view, big room, friendly staff with full of smiles. 5min to kata beach. Free shuttle bus provided. Definately will come back again! Fantastic holiday there. Fit with what we expected, Quiet , modern, and clean. As Nice as expected, except Need to walk up the hill about 100meters on sunshine , which cause a sweat after short trip to town. viewed b4 I reserved , but check it out the hill. If you have kid ,it will cause the Minus . Otherwise Nice hotel. The hotel look like 4 stars hotel but service and staffs meet 5 stars standard and room very big. Breakfast not really good, I stay 5 nights but every day breakfast was same, recommed peoples stay here. 1) Location: It is about 45 minutes journey from Phuket Airport. Avista is located on the hillside of Kata, with plenty of restaurants, minimarket and shops nearby the hotel - about 5-10 minutes walk. Walking path is by the main road and it is safe and secure. Yes, there is a steep hill to climb up to but the steep hill is only about 100 metres distance, which is still managable in my opinion. Kata Beach is about 10 minutes walk from the hotel. Overall, i think the hotel location is ok although it is located on a small hill. 2) Grand Deluxe Room: We were given room 332 and 324 which has restricted balcony view. As we were staying for a night, the view from our room doesn't really matter. IIt has one king size bed and one queen side bed. I love the blue lighting used in the room. It does look very luxury and classy. Mattress and pillows provided are of very good quality and very comfortable. The bathroom is also very spacious and modern. The shampoo and shower gel provided is of very good quality and it is very aromatic. Two thumbs up. 4) Buffet Breakfast: Most of the food items are delicious. It is not a wide spread but the spread was quite good. I also love the fact that the hotel provides free coffee in various types (mocha, latte, cappuccino etc) and the coffee is very good. However, in my opinion, since this hotel is a 5 star hotel, they can improve on the selection of fresh fruit juices. At the moment, the juices available are bottled or chilled juices which is not impressive for a 5 star hotel. Overall, i think this hotel is probably one of the best hotel in Kata.